When you are a franchisee owner you have the good: customers know your name and product; but you also have some challenges: you have to follow the corporate/franchise manual to the letter of the law so you do not have much room to change things/improvise for fear of losing those customers. The November 5, 2009 Businessweek has a story “The Accidental Hero” about Stuart Frankel, a franchisee of two Miami based Subway sandwich shops. After noticing sales sagging he came with the idea of selling the footlong sandwich for $5. “Stuart Frankel’s $5 footlong idea illustrates how a huge company can wake up and eventually seize on a good idea that’s not generated at headquarters. Frankel, along with two other local managers in economically ravaged South Florida, ceaselessly championed the idea to Subway’s corporate leadership amid widespread skepticism. 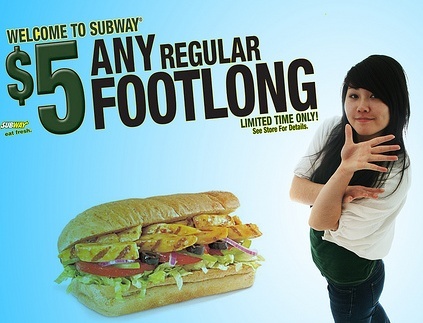 Once it was approved, Subway’s marketing team quickly generated a memorable campaign that firmly established the $5 footlong nationwide. For Frankel, the biggest surprise from his $5 promotion was that his profit margins didn’t decline. Many promotions are so-called loss leaders designed to draw customers in the hope they’ll buy higher-margin items alongside the featured special. Even after adding two new staffers, Frankel made money on each $5 sandwich. In September 2007, Steve Sager, a Subway development agent who oversaw about 225 franchises across South Florida, heard about the success of Frankel’s $5 deal. He decided to try it in a troubled Fort Lauderdale outlet on Commercial Boulevard, a gritty thoroughfare dotted with strip malls. On the first day of the promotion, the store nearly ran out of bread and meat. Sales doubled. Sager called Subway co-founder Fred DeLuca, who lives in the vicinity, and excitedly shared the news. An intrigued DeLuca came by the shop and, Sager says, “saw the potential instantly.” Clearly, the South Florida crew was onto something. The question was whether it would resonate elsewhere. “Unless it was in your store, you were skeptical,” Moody says. At a meeting of the franchisee marketing board that fall, Frankel presented his idea. Many owners thought the promotion would send food and labor costs soaring, erasing any hope of profits. A motion to roll it out nationally failed. What do I like about this story? The ability of a great idea starting far down the chain, and then successfully getting the attention of the top brass that has the sense to implement it across the board. And you know you are on to something when your competition starts copying your strategy as well. Click here for video of the story.